Fig.1 - John Halas and Joy Batchelor. Wardour Street, Soho was once referred to as “Film Row.” In 1951, Sight and Sound published a list of British and Hollywood companies and studios in active production. The list featured over twenty-seven British film production companies, British subsidiaries of major Hollywood studios and documentary/short film production with headquarters located on Wardour Street and the surrounding Soho district. Perhaps unsurprisingly, there were also multiple animation studios located within the square mile. This included John Halas and Joy Batchelor (Fig. 1) whose offices were located at 10a Soho Square (a short walk from the offices of the British censors) in 1962, and Bob Godfrey’s studio Biographic Cartoons. Godfrey, the Academy-Award winning animator, and “godfather” of British animation operated at a Dean Street location from 1960 (Smurthwaite 2001). There is currently an absence of academic literature into the existence and significance of animation studios who were undeniably part of the Soho filmmaking fabric. It would appear too, that the animated productions by these studios during the immediate post-war period and in the 1960s echo the historical function of Soho as a refuge for immigrants, the urban and social/cultural development of the area following World War Two, alongside the growing permissive society. Following World War Two, local entrepreneurs, in consonance with the popular press, were responsible for reinventing Soho for the nation and globally, re-articulating its reputation in the public sphere as a site of cultural and sexual transgression to one of mass popular commercialism. Fig. 2 - Halas & Batchelor advertisement, Television Mail (1962), p. 4. In the following article, I hope to resituate two animated films by Halas and Batchelor and Bob Godfrey in the Soho context, highlighting the ways they reflect the post-war development of the demi-monde of the metropolis. This is a new approach to tracing the antecedents of British animation through an urban, cultural and sociological approach. Like Mark Shiel who has written on the “spatial turn” in social and cultural theory since the 1970s and of “a growing recognition of the usefulness of space as an organizing category, and of the concept of ‘spatialization’” (2008: 5), I too, am interested in the ways these animated films “imagine” the space of Soho two-dimensionally. Myers’ description of Wardour Street as “shady” could be a reference to street prostitution. However, as Richard Tames has suggested, it could also form part of a critique on the questionable commercial ethics of the entertainment industry. We must also include within this interpretation the geographical convergence of the film, music and commercial leisure/retail industries in the area. For instance, the world-renowned music publishers Novello & Co. who built Novello House, located at 152 – 160 Wardour Street in 1906. Today, Novello House remains in use for the music business as a retail branch for Yamaha Music. Additionally, the street has played host to a variety of night-time economies that sprung up during the mid 1920s and continued to flourish prior to and during the Second World War. By the 1950s, “Soho’s bohemian character was changing under the impact of music-based cultures with their emphasis on youth…jazz and blues musicians and their audiences” (Mort 2010: 227-228). The notorious underground jazz clubs and private drinking dens which once lined the street from the mid 1950s – 1960s such as The Flamingo Club at 33 – 37 Wardour Street and The Marquee Club at 90 Wardour Street preserved the ongoing tradition for Soho’s “reputation for transgressive nightlife [which] vastly expanded from restaurants and cafés to a handful of illicit bohemian dance clubs located in underground basements” (Walkowitz 2012: 215). Wardour Street’s function as an entertainment centre has rarely been discussed independently to the individual histories of leading members within the British film industry. Geoffrey Macnab provides wonderful anecdotes about film impresarios in Soho within his biography of J. Arthur Rank where renowned filmmaker David Lean wrote of “nerve-racking afternoons spent in Wardour Street viewing rooms” and the “doyen of distributors” C.M. Woolf guided his protégé Rank “through the dark vale of Wardour Street where there were rumoured to be ‘shadows on both sides’” (1993: 22-23). More recently, British Pathé produced a short film entitled 8 Things Made Inside 103 Wardour Street for its online community. The film explores eight functions of the Pathé Building, located at 103 Wardour Street. Opened in 1910, the Pathé building was used for multitude of production purposes until 1970. This included the production of newsreels, films, music and radio recordings. Despite retaining the original name, the building now houses luxury apartments. The identity of émigré animator John Halas who was born in Budapest, undoubtedly influenced his work with creative partner and wife Joy Batchelor who from 1940 produced animated advertisements which combined “Disney-style characters” and “Eastern European aesthetics”. The Charley films made from 1948, I argue, are similar to the attempts made by the media and commercial enterprises to reinvent Soho’s multifarious reputation in the public sphere as a cosmopolitan space which continued to publicly obstruct the new planning philosophy and technique which was transformed during the Second World War. Seeking a more broader perspective beyond the monumental County of London Plan and Greater London Plan devised by Sir Patrick Abercrombie (1879 - 1957) and John Henry Forshaw (1895–1973), Peter Larkham and David Adams of the Birmingham School of the Built Environment describe post-war reconstruction of London and its planning philosophy and technique as “resulting in the emergence of what has been termed a ‘grand synthesis’, a ‘comprehensive, normative model of urban form’” (Larkham and Adams 2011: 33). The self-consciously progressivist London County Council (LCC) envisaged London as a modern imperial metropole and in conjunction with the Soho Association, the LCC’s new approach to the urban regeneration of Soho meant the fair could take on the form of “counter publicity to offset the area’s disreputable reputation.” Their idea? To create the first Soho fair, which would highlight Soho’s cosmopolitan past on a global stage. Drawing on Soho’s reputation for cultural and ethnic diversity, the organisers were able to “create an idiosyncratic mood of celebration that could be marketed to local and national audiences via the media and entertainment industries” (Mort 2010: 198). Charley in New Town (Halas and Batchelor, 1948). There are many absurdities at the Soho Fair…A garish Dutch organ plays in Golden Square, painted with Elizabethan musicians and Victorian odalisques: a band of West Indians pours out Latin-American rhythms…Bohemian young Frenchman…a dark, Celtic Lady plies a spinning-wheel in Shaftesbury Avenue. If the absurdity and gaiety of the Soho fair was chronicled in animated form by Halas and Batchelor, it most certainly would have been guided by the animated figure of Charley. Florian Scheding states the character of Charley was the “everyman through whose eyes British audiences could learn about the various reforms [as he] explores post-war Britain on his bike…Halas & Batchelor mastered the technique of packaging a complex political message of a dauting scale into a focused, humorous…light-hearted film narrative” (Scheding 2016: 227). In Charley in New Town (Halas and Batchelor, 1948), which was made on commission by the Chancellor of the Exchequer Sir Stafford Cripps, we are also subjected to a town hall meeting style, where voices of men and women are superimposed onto an animated evolving urban sprawl. The film moves us through the various plans of post-war development of Britain’s towns and cities where dubious and vociferous voices question it at every turn, particularly as to whether pubs should be built in suburban areas. It is also reminiscent of Burt Hymans documentary Sunshine in Soho (1956) a colourful and whimsical journey through Soho and a film record of the first Soho fair. Fig. 3 - Polygamous Polonius (Bob Godfrey, 1960). The mid-1960s also saw the ride of Michael Klinger, a Jewish producer and Soho native, whose roots as a nightclub and underground cinema owner blossomed into a film career spanning several decades. He is best known for giving outré directors their start in the industry, producing such breakthrough, today considered cult films such as Roman Polanski’s Repulsion in 1965 and Mike Hodges’s Get Carter in 1971. Andrew Spicer’s surmised that Klinger’s dedication to supporting burgeoning directors showed the “complexity” of his ability to straddle several modes of production – “exploitation, middle-brow and art-house” (2010: 302). Similarly, Godfrey’s animated sexploitation films engaged with these modes, conveying the changes to cultural, social and sexual frameworks by the end of the ‘Swinging Sixties’ and towards the onset of the ‘psychedelic’ 1970s. Perhaps for Halas and Batchelor and Bob Godfrey, working as creators of animation within a period undergoing dramatic technological and social transformations in an area with a mutable and ‘imagined’ identity formed part of their inspiration, whether aesthetically or in choice of subject-matter. Today, Soho is no longer considered the demi-monde of London and its bohemian past is threatened by rapid commercialization. Although it no longer houses the offices and headquarters of film production, it remains the home for VFX, post-production and editing studios. Soho’s role as a filmmaking locus provides further fascinating discourse into its significance, placed within the context of British filmmaking and London history, it contributes towards the expanding scope of scholarship on cinema and the city and highlights the convergence of the imagined space of Soho with the imagined sphere of animation. See “Film Companies and Studios” lists British and U.S film production companies in London. See Sight and Sound 19, no. 10 (Mar 01, 1951), 69. See page 215 in Richard Tames. London: A Cultural History (Oxford: Oxford University Press, 2006). 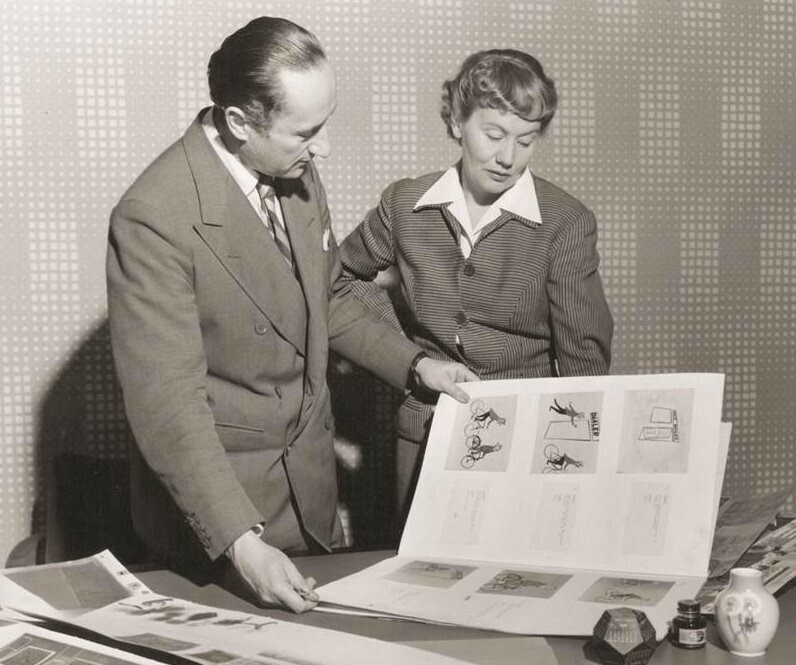 See Paul Wells, “John Halas and Joy Batchelor”, BFI Screenonline, http://www.screenonline.org.uk/people/id/581849/index.html/. “A Fair Week's Run for the Real Soho.” The Observer, Jul 10 (1955), 10. Edward Hyams laments the old Soho where you could “if you had the odd taste for it, see actors, artists and writers eating.” See his piece “Pretending to be Soho”, The New Statesman and Nation 50, Jul 16 (1955), 65 – 66. See “THERE ARE MANY Absurdities at the Soho Fair.” The Spectator 195, no. 6629 (Jul 15, 1955): 86. See Jez Stewart and Bob Godfrey, BFI Online, https://www.bfi.org.uk/news/bob-godfrey-1921-2013/. Macnab, Geoffrey. J. Arthur Rank and the British Film Industry (Cinema and Society) (London: New York: Routledge, 1993). Larkham, Peter, and David Adams. “The postwar reconstruction of planning of London: a wider perspective,” Centre for Environment and Society Research Working Paper series no. 8 (Birmingham: Birmingham City University, 2011). Mort, Frank. Capital Affairs: London and the Making of the Permissive Society (New Haven, Ct: Yale University Press, 2010). Myers, Harold. “Wardour St. Back When,” Variety (January 20, 1988): 126. Scheding, Florian. “I Only Need the Good Old Budapest: Hungarian Cabaret in Wartime London”, in Twentieth-Century Music and Politics: Essays in Memory of Neil Edmunds, ed. Pauline Fairclough (London: Routledge, 2016), 211-230. Shiel, Mark, “Cinema and the City in History and Theory,” in Cinema and the City Film and Urban Societies in a Global Context, eds. Mark Shiel and Tony Fitzmaurice (Chichester: John Wiley & Sons, 2008), 1-18. Smurthwaite, Nick. “One Man and his Wobbly Dog”, The Guardian (April 20, 2001), available at: https://www.theguardian.com/film/2001/apr/20/culture.features2/. Spicer, Andrew. “Creativity and commerce: Michael Klinger and new film history,” New Review of Film and Television Studies Vol. 8, no. 3 (2010): 297-314. Tames, Richard. London: A Cultural History (Oxford: Oxford University Press, 2006). Walkowitz, Judith. Nights Out: Life in Cosmopolitan London (New Haven and London: Yale University Press, 2012). Jingan Young is a PhD candidate in the Department of Film Studies at King’s College London. Her research focuses on the cinematic representations of the area of London’s Soho in post-war British cinema. Her Soho Bites podcast features interviews with academics and critics such as Peter Bradshaw and can be found on ITunes here. Jingan is also a playwright and editor of ‘Foreign Goods’, the first collection of British Chinese plays published in the UK by Oberon Books. She is a regular contributor to the Guardian and Hong Kong Free Press. You can follow her on Twitter @jinganyoung and her research @sohoonscreen.